Faux Leather T-Shirt by Open. This faux leather t-shirt is the basic black tee with a leather edge. Regular fit raglan t-shirt in black with matte, faux leather sleeves. Constructed with crew neck and split hem with scalloped corners. Body of faux leather t-shirt made from lightweight cotton blend. Leather sleeves run very tight and do no stretch*. A must-have for leather lovers that looks great with rock-inspired pieces. Faux leather t-shirt is the perfect way to look biker chic in the comfort of a tee. *Check measurements tab below for measurements of sleeve circumference. *Sleeve armholes run very small. 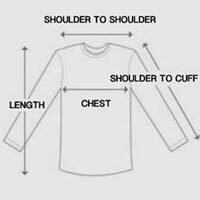 If your upper arms run large, order one size larger than normal. Model is wearing size XXL. For accurate measurements, check the table below.